I love this and only wish the Moozi was available a few years ago when I was up late nights and needed to make a perfect temperature bottle for my hungry little guy. The Moozi does for Baby Formula what Keurig did for coffee. 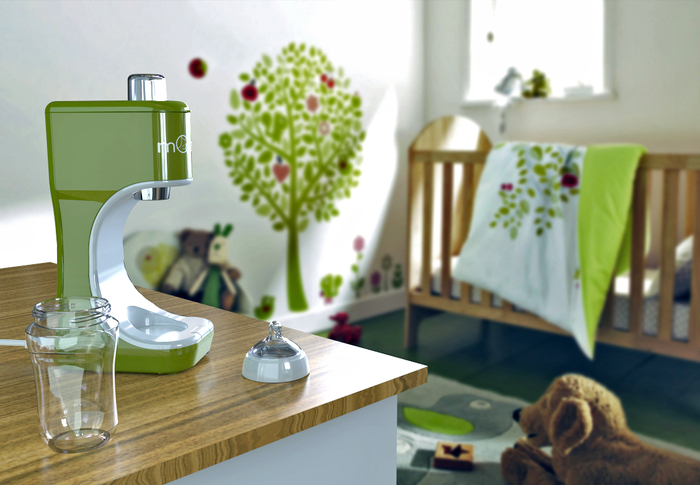 Invented by Miriam Kutcher a mother of two girls the Moozi is Love Made Simple. Freshly prepared formula made at the touch of one button! At any time of the day or night, it couldn’t be easier to make the perfect bottle! You want the formula that’s right for your baby. With Moozi’s single-serving reusable pods, you choose whatever formula you (and your baby) prefer and how much you will use for each feeding. Each Moozi comes with 3 reusable pods. Each pod holds up to 8 oz. of powdered formula and additional pod packs are also available for purchase. Moozi has you covered! Safety is of utmost importance with Moozi. The water sensors ensure there is water in the tank and the water temperature is regulated. The bottle sensor alerts you if there isn’t a bottle in position. Moozi will do all of the thinking for you, so you can be stress free and focused on your little one. Your wrist is no longer needed as the test strip for figuring out the perfect temperature bottle! 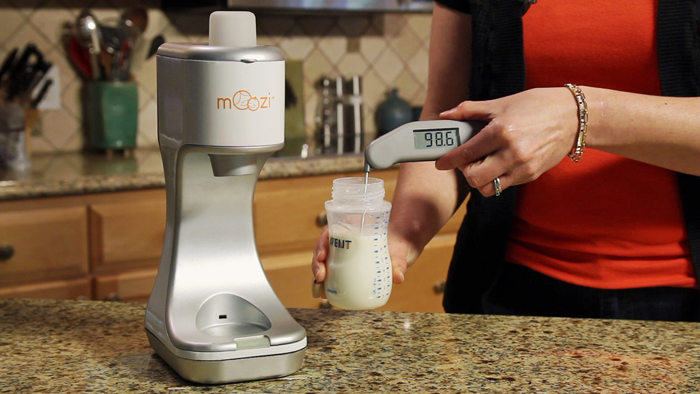 Body temperature is approximately 98.6 degrees — so is the formula made in the Moozi. Moozi’s unique dry release system keeps the formula and water separate until they mix in the bottle. The dry environment reduces bacteria growth and keeps the system running smoothly. Moozi is a single use formula preparation system. Your bottles are always fresh. What you put into Moozi is what you get out of Moozi, so you safely ensure consistency each and every time you use it. Cleaning Moozi is as easy as operating it. The dispensing funnel is removable and top-rack dishwasher safe. Parents decide what’s best for their infants. Moozi works with upright wide-neck bottles. All formula brands work in the Moozi reusable pods, so you decide what’s best for your infant and how much you need to use. The Moozi is set to hit retail stores in late 2015. Miravan,LLC the manufacturer is offering potential backers an advance offer to purchase the Moozi at the discount price of $125 through their Kickstarter campaign. And if you do not need a Moozi for yourself you can donate $100 and a Moozi will be donated to a Military family through Operation Shower, as well as local Massachusetts area shelters.